You Don't Need A New Window! We say that If your window is jammed shut and the lock wont work for one reason or another this doesn't mean that you need a new window. Our experience has shown us that most windows can be repaired. Be it a new or upgraded mechanism, lock, gearing or hinges. We can open your window without damaging the window or frame. Repair or replace the relevent parts and get your window working as good, if not better than new. The hard sell from some companies is that the lock or mechanism is out of date or obsolete and that the only way forward is to fit replacement doors and windows. If the parts are obsolete we can source updated versions or alternatives that will carry out the window lock repairs and do the same job or offer better security at a fraction of the price of the cost of a new window. We can replace damaged or faulty hinges. We can carry out window lock repairs to faulty mechanisms especially on tilt and turn windows. 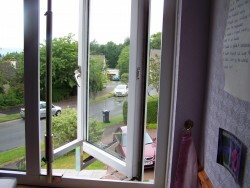 We can open jammed windows and carry out window lock repairs. We can eradicate draughts and leaks - no need for replacement doors and windows. We can replace or upgrade handles and other furniture to enhance the look or provide keyed locks [insurance purposes]. We can re-align window hinges so that the window works smoothly. Working around Glasgow, Paisley and Dunbartonshire, we are an independent company specialising in repairs to PVCu and Aluminium windows and doors. As a double glazing and uPVC windows and door repair specialist, A.L.S. Locksmith Glasgow provide a fast and efficient service to domestic customers who have had double glazing products installed by companies who are no longer trading or where guarantees provided are no longer valid. Window security is more often than not forgotten about until the worst happens and then it becomes a priority but it doesn't have to come to that. By spending alittle now on good quality window locks you could prevent the worst from happening by upgrading your window home security. Your insurance policy states "that if a window is accessable without the aid of a ladder then keyed window locks should be installed." Can fit any type of lock to any kind of window. We advise that taking your insurance requirements advice or not you should consider fitting keyed security window locks to all windows in your home. Affordable Locksmith Glasgow will come to your home and access the state of your home security. We will advise on the type and number of window locks required and then arrange a time and date suitable to upgrade your window home security. Window Security locks supplied & fitted by Affordable Locksmiths in Glasgow. UPVC, sash, wooden and aluminium windows catered for, for your home security needs. Burglary is a crime of opportunity and as such most of the attention is placed solely on the state and level of protection on our external doors, leaving window security as an after thought. The majority of PVC amd sash windows do not create much of a barrier to the would be thief. It is adviseable to fit additional window locks for good home security. Can save you money. By getting your badly locking door looked at now I could save you the cost and inconvenience of UPVC door repairs at a later date. So if you need a local, Affordable Locksmith Glasgow. You can contact us via telephone (ask for Steve), or the enquiry form on our Contact Us page. No Call Out Charge, Quotes and Estimates are FREE!